King of the Splits returns. 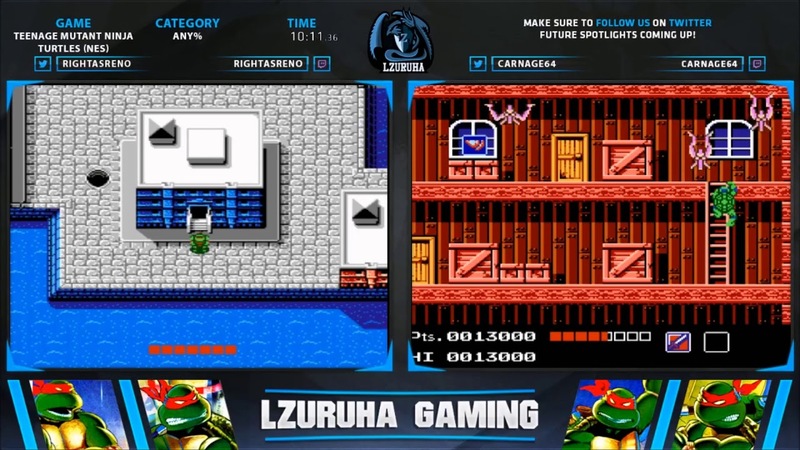 Xephyr couldn't make it last minute so RightAsReno has stepped in to torture himself in Teenage Mutant Ninja Turtles vs CarNage64! *Spoilers* One reaches the end of his sanity levels before they both agree to call it a tie. The Ninja Turtles are on a mission to retrieve the Life Transformer Gun from Shredder, a device that could restore their sensei Splinter back to his human form. The Turtles' first objective is to rescue their reporter friend April O'Neil, who is being held captive by Bebop and Rocksteady somewhere in the city. After rescuing April, the turtles must swim underwater to disarm a series of bombs set to destroy a dam, rescue Splinter from the Mecha Turtle, destroy a giant Mouser, find the Technodrome and eventually defeat Shredder. This Sunday, the first "King of the Splits" will be held which is a King of the Hill race series of random games. The winner will continue onto a new challenger and new game until he or she is dethroned. This is a super casual, blind racing with some guests to commentate the race as well cause a little trouble and banter between the racers. All times are GMT-6. This page was generated at 04:55 AM.